What a great finale for a wonderful series! I liked the books quite a lot when I first read them as they were released, and I liked them even more reading the series straight through. It became more obvious how the characters developed, how the team found strength in each other, and how the stakes were raised higher than ever in the battle between Greek and Roman demigods. For the first time, we get chapters from Reyna and Nico’s perspectives. My love for Nico has hopefully already been established, so it is no surprise that I love his chapters. But Reyna is also amazing, and my love for her grew exponentially now that I read all the books in order and could remember her better. She doesn’t take center stage until this last book, and boy, does she ever! I was a little disappointed when seventh-wheel Leo found love, thus “proving” that heroes are only “worthy” if they also have a love story. But Reyna gives us a hero who is explicitly told that romantic love will not save her…and she’s like, well, that’s disappointing, but I’m going to keep being awesome anyway. Truly, she is the hero we do not deserve. AND NICO! I love him. I love him so much, and I just want to wrap that self-hating and self-sacrificing idiot in the biggest hug imaginable. I was ecstatic to see him starting to make friends, trust people, and even falling in love with a guy from Apollo who is a healer. Could he have an any more perfect complement? 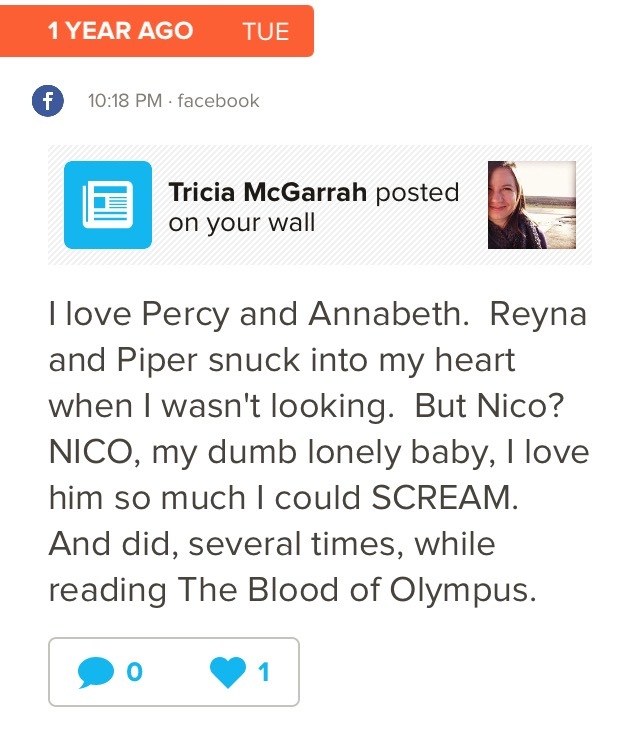 I found an old Facebook status that I wrote while reading The Blood of Olympus the first time around, and it summarizes my feelings for Nico quite well. I haven’t even touched on the main storyline, but maybe that’s because it’s obvious that Percy, Annabeth, and co. are going to be awesome and save the day. Which they do, and it is great! Especially since the final showdown goes down in Athens, and I am already eagerly anticipating standing on the Acropolis and imagining a demigod/giant battle raging around me. But I’ll be honest: I was mostly here for Reyna and Nico, the fictional children of my heart.